I've always been a big Pink Floyd fan, but I never really caught on to bands like Dream Theater or Fates Warning. It's not that I don't respect those bands - their talent and contributions to rock'n'roll are undeniable - it's just that I never really hooked into their sound. For example, I have every single Pink Floyd release ... I've only got a couple Dream Theaters and maybe one Fates Warning. Based on what I've heard, however, I'd have to say that Nemesis are much closer to Dream Theater or Fates Warning than they are to Pink Floyd. The songs herein are all richly tailored and well-performed and, although I've heard others say differently, the production sounds quite crisp and clear to me. I wouldn't go as far as to call Nemesis progressive metal (which I've also heard them described as) but they're definitely progressive rock and sometimes pretty hard rock. Sometimes just the opposite, too. The songs are lengthy, sophisticated and emotionally charged. The music has as much to do with what the band's trying to say as do the words. Speaking of words, according to the liner notes, "Eden?" is the Hungarian band's first recording in English. You'd never know it from the smooth, controlled vocals of Zoltan Kiss. A hint of an accent may creep in here or there but it's only a hint. The last track on the CD, "Viragenek" is a Hungarian folksong and is recorded in the band's native language. It's a haunting piece. Another of my favorite tracks, "Faith," is recorded in the international language of music. It's a short but excellent instrumental in the vein of Joe Satriani that tells a story of its own. Fans of bands like Dream Theater will no doubt become fans of Nemesis. This is one of those CDs that makes you want to seek out the band's earlier releases, whether they're recorded in English or not. 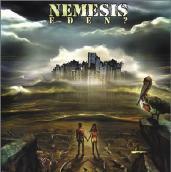 Nemesis: Gyorgy Nagy - keyboards; Casba Berczelly - bass, acoustic guitars; Zoltan Kiss - vocals; Laszlo Nagy - drums; Zoltan Fabian - guitars, acoustic guitars, sequencer programming. For more information, check out http://www.lasercd.com/default.asp.